Star Trek: Fleet Captains has expansions for the Romulan Empire and Dominion. 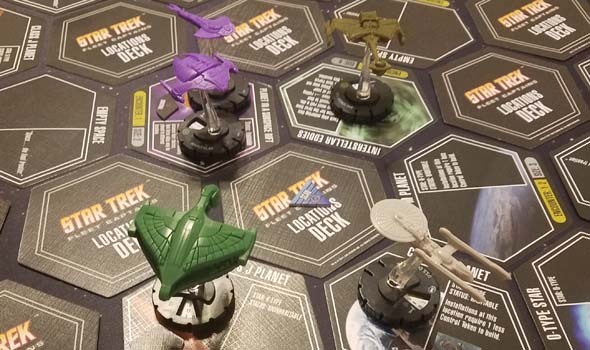 Even though it is a kind of mediocre game, my friends and I liked Star Trek: Fleet Captains enough that we were excited to try out the game's expansions. There's a nice, episodic feel to the game that does do a pretty good job of capturing some of the feel of the source material. Fleet Captains has two expansions, which each offer a new playable faction: the Romulan Empire and the Dominion. Both expansions revolve around the same two core mechanics (espionage and saboteurs), but each has its own unique methods and techniques for how they utilize those mechanics. Since both expansions have similar features, I'm going to review both expansions together. The Romulans are my favorite race in Star Trek I like Romulan makeup. I like their uniforms. I like their ship designs (especially the warbirds). I like their cunning. And I like the depictions of the Romulans in every era of Star Trek, except for Star Trek: Nemesis and Star Trek: Enterprise, which both managed to ruin a good thing. So opening the Fleet Captains box to find no Romulan ships was - of course - disappointing, and the very first thought that popped into my mind (after "Ooh, plastic space ships!") was "I should check if there's a Romulan expansion to this game". Sadly, it was sold out on Amazon, and eBay sellers wanted upwards of $150 for copies. I didn't want a Romulan expansion that badly... But my girlfriend, being awesome as she is, eventually saw the expansion come back in stock on Amazon and immediately ordered a copy for me to surprise me. So as I was getting ready to organize some game sessions to play the Dominion expansion and resigning myself to the idea that I'd never play the Romulans, a shiny, shrink-wrapped copy of the expansion literally showed up at my door step. She's a keeper! 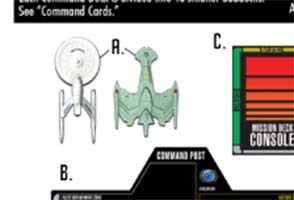 I don't like the monochrome ships, but at least the Romulan ships are the same color as in the show. 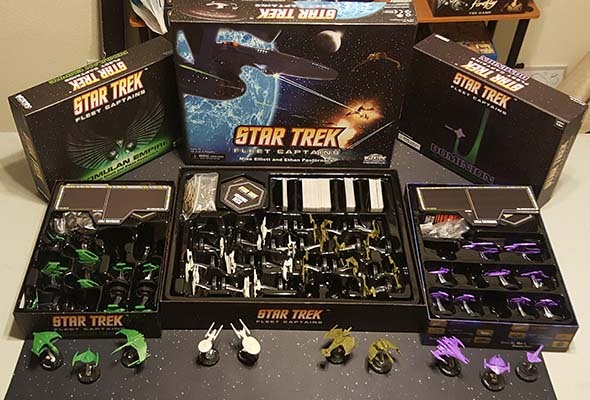 Star Trek: Fleet Captains is an exploration and combat board game by WizKids. Good Star Trek games are few and far between. That goes for both video games and board games. Part of the reason for this is that it's often difficult to capture the spirit of Star Trek when trying to adapt it into en existing game genre. This is why Trek-themed games end up turning into dull shooters or tactical combat games. Games about exploration or scientific discovery, or role-play are sadly uncommon in video game formats (which is what makes 1999's PC game Birth of the Federation stand out to me as an underrated Trek classic). Sure it was just a reskin of Master of Orion II, and it had lots of technical and A.I. flaws, but in a market dominated by cookie-cutter games like Star Trek: Armada, Elite Force, and Invasion, Birth of the Federation was a rare game in which "exploring strange new worlds" and "seeking out new life and new civilizations" was a primary game mechanic. Board games and table-top games have maybe fared a bit better than video game adaptations. We have our Dungeons & Dragons-inspired role playing games, our tactical starship simulators, and then countless board game reskins (ranging from Monopoly to Settlers of Catan, and virtually everything in between). Most of these games are pretty old, but there's also a handful of newer Star Trek games that run the gamut. 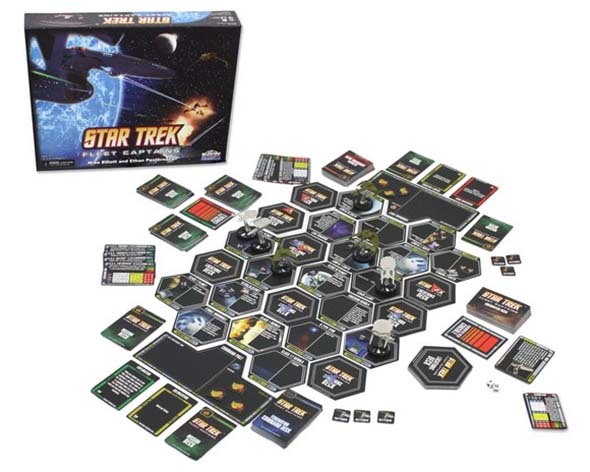 One such game is WizKids' Star Trek: Fleet Captains. WizKids is probably best known for its Mage Knight and Hero Clix miniatures games based on fantasy, video game, and comic book characters. The bases for these figures include a rotating dial that allows the player to change the attributes of the character to one of several pre-set values. This can include altering their combat attack power, hit points, mana, or any other value that the specific game might require. 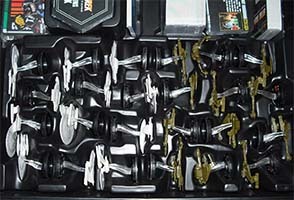 Fleet Captains uses a similar clix system as the backbone of its starship management mechanics. My first impressions upon opening the box was a bit disappointing. I'm not a big fan of the ship miniatures. They're fairly well-detailed and made out of a sturdy plastic and seem like they should stand up to a lot of play, but that's the only thing that I like about them. They take up a lot of space, making it difficult to cram more than two or three ships on any single hex. There seems to have been some effort made to scale the size of the Federation ships with one another, but it isn't consistent. Voyager, for example, is almost as large as the Enterprise E, but the Enterprise A and Reliant are noticeably smaller and appear decently-scaled against the Galaxy class Venture. Klingon ships, however, seem to have no effort put into trying to appropriately scale them. Birds of Prey and classic cruisers look huge compared to most Federation ships and to other Klingon ships. The Negh'var, despite being one of the largest ships in the game, just doesn't seem as massive and intimidating as it should be. the actual miniatures [RIGHT] are unpainted and not to-scale with one another.